I about fell over when I read that! I think times have changed a little bit since then! By the way, Scott’s Emulsion was cod liver oil. That must have been fun for the little kiddos to have to swallow every day! My first album ever was the Partridge Family. What can I say. I was 10. I really wanted Bobby Sherman but I couldn’t find his album in the 2 or 3 stores my mom took me to. I was buying this with my own money and that money was burning a hole in my pocket. This purchase was a big deal to me and I couldn’t go home without an album. Sorry Bobby, you were my second album. Here is that first album. This was supposed to be the first album but it was the second one instead. Isn’t Bobby just adorable? What was your first album/cassette/8-track? Or, if you aren’t quite as middle-aged as me, what was your first CD? I had to go to the DMV today to renew my driver’s licence. With no forewarning, no wardrobe planning, no makeup application, and, worst of all, with nothing done to my hair other than brushing it, I had to have a new photo taken! OMG! I can only imagine how that is going to look. I just bet I am going to be stuck with that stunner of a photo for another 15 years! Can’t wait to see it! One of the reasons my hair was a bit crazed today is because I went on a little adventure early this morning. An elderly lady who was a descendent of a pioneer family in my neck of the woods has been moved out of her home. Her family ignored her wishes and put everything up for sale. A friend and I went on a mission, leaving at 5 this morning, to go to the estate sale in the Los Angeles area and see if we could rescue anything of historic importance. It was a nightmare of extraordinary proportions! It was raining cats and dogs, the woman running the sale had a Hitler complex, and there were about a 100 people there all desperate to get into this house. On top of that all of the books, notebooks, etc had been put in the back yard and covered with plastic. We were not allowed to look at those due to the rain. My friend and I just stood and looked out at all the of books and papers likely getting ruined in the rain and mourned. In the end we staggered away with a few things, trying to keep the few precious photos we rescued from getting wet, and out to breakfast to recover. My friend and I agreed: Never again! Now you know why I didn’t look so swift at the DMV. 1. Assume you are going to sweat and dress accordingly. Dark fabrics are more forgiving when it come to large sweat patches. 2. If your husband is dropping you off and picking you up tell him it is not cool to stand in the door way and ogle all the women bouncing around. Also tell him if I am there, he will hear about it (and he did). 3. Don’t take fun cell phone photos of your friend in Zumba class. There are 60 women there and some of them are going to end up in your photos, and they probably do not want what they look like doing Zumba memorialized in someone else’s photo. 4. Sorry to any men who may be reading this one. Two words: Sports bra. 5. Bring a water bottle. You will be very sorry if you don’t. 6. Depending on your feelings on the matter, seek out or avoid the small woman who does her own thing by flailing around instead of trying to do what the teacher is doing. If the fear of being kicked adds a certain excitement to your Zumba experience, then, by all means, stand right by her. If the fear of being kicked doesn’t thrill you then make sure you permanently move to the other side of the room. 7. Plan to laugh at yourself A LOT when you seem to be unable to do what the teacher wants you to do. Laughing is way better than crying! When I turned thirteen years old my mother let me get my ears pierced. Other than the fact that I ended up with holes in my ears I have no memory of the event. I don’t even remember if it was painful. I do remember the thrill of getting to wear earrings. It made me feel so grown up! I also remember that I had to keep the little gold balls in for several weeks and wipe them with alcohol to prevent infection. But the thrill of getting to wear earrings more than made up for the inconvenience. 1. Sleeping with earrings on is just as annoying now as it has ever been. 2. While I look forward to being able to wear earrings again, I am not nearly as excited at 51 as I was at 13. 3. Sending a pointed piece of metal though the earlobe at a high rate of speed hurts. I may have forgotten that fact from my ear piercing at 13 but I will never forget it from my piercing at 51. It was a fascinating combination of a nasty stinging sensation and the feeling that someone was grabbing my earlobe and pinching it very hard. Nothing to keep me from doing it again but definitely not pleasant. 4. Those people who pierce their babies earlobes are just mean. Having had it done again reminded me how much it hurt. I can not IMAGINE doing that to an infant. I don’t care if everyone thinks your little girl is a boy. DON”T DO IT! 5. I have already started spiffing up my long outdated earring wardrobe. I can’t wait to start wearing more earrings ! 6. Once again, people who say I have holes in my head will be making an accurate statement. I just checked out a blog for the first time. I try to do that every once in a while, see what some of those millions of other bloggers out there are doing. This blog is called “Underachiever’s Guide to being a Domestic Goddess.” Obviously the woman has a sence of humor, always a good start for me! Then I saw her January 2nd post and the nightmare began…. It was called “Knock Knock” What was knocking at her door? All of those things she promised to do ”after the holidays.” Well “after the holidays” has arrived and now all of those things she told herself she would do , things like sorting the kids toys, organizing and weeding out their clothes, getting into an exercise routine, watching less television, are here and waiting for her to get her act together! Her amazingly long list just made me queasy, because it included many things from my “after the holidays” list. Today is January 16th and I was doing such a good job of ignoring the fact that it was after the holidays. But, because of my fellow blogger, I can no longer forget, and so the cause of the nightmare! What is knocking at my door? Organizing my walk in closet, which is very small for a walk in closet. Getting into a better cleaning routine, instead of the frantic “friends are coming over” craziness that dominated 2012. Picking out tile for the bathroom floors so that little project can get done. Getting some major garage cleaning done. Organizing the coat closet to, in someway, make better use of that space. Oh yeah, finding a job! What is knocking at you door now that the holidays are over? I’m Trapped Someplace Cold and I Can’t Get Out! For those of you who may be reading this who happen to live in a place where it actually snows during winter, this post should either be skipped or you should prepare yourself for a big laugh. What can I say, I have thin blood! There is a reason lots of people live in Southern California: the weather. We certainly don’t live here because of the unique people we seem to get for governor, because we are close to Hollywood, or because we think earthquakes are fun. My county is flooded with a unique species called the “snowbird” every winter because it is warm here when other places are cold. That is until recently. We still don’t have any snow in these parts but boy oh boy this winter has been cold! I have no clue what to wear anymore. Actually, I don’t OWN what I need to wear! We had a late lunch on Sunday so we weren’t ready to think about dinner until 6:30 in the evening. We (OK, I) decided food from our local Mexican place sounded good. I convinced Hubby to get off the couch and come with me to pick up the food. We walked outside to the car and my oh my! It was cold. Not chilly, cold! We hoped in my car and turned the car on. The dashboard helpfully confirmed that it was 48 degrees. Dear lord! How could this be? By the time we got the food and got back into the car it was 46 degrees! I feel like my life has been moved a thousand miles north and no one told me about it! Some sort of unusual weather pattern is bringing cold air from Canada according to the weatherman, so I guess I am not too far off with that feeling! About 10 that night one of our famous Santa Ana winds kicked up. So we got freezing overnight temps with howling winds! Fun times. I seriously do not own the kind of clothing it would take to feel warm and cozy under such circumstances. One of those parka coats, the kind that go down past the knees, that sounds great right now. I can’t even buy one around here if I wanted to. Rumor has it is warming up today in these parts to more normal temperatures for this time of the year. I sure hope so! I love cooler weather but my thin blood has no idea how to deal with this cold air from Canada! 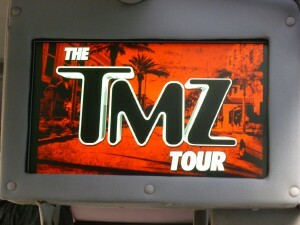 Please don’t judge me, but for my birthday I wanted to go on the TMZ tour. For those of you who don’t know, TMZ is a TV show that specializes in celebrity gossip. They also have a website/blog with the same information. I don’t usually watch the TV show but I am addicted to the website and check it most days, well, sometimes many times a day. My birthday was back in November, but the tour was postponed until Christmas break otherwise the girls wouldn’t have been able to go along. We don’t live that far, as the crow flies, from Hollywood, or anywhere in Los Angeles, but when you factor in the traffic, the unknown problem of car accidents blocking the freeway (we dealt with two on our little trip) it makes Hollywood seem like it is very far away from my home in inland So Cal. Just driving to Hollywood is a trip through the world of TV and movies. We drove past Melrose Avenue, past the iconic buildings of downtown LA, Sunset Avenue, and the amazing Capitol Records building. Who would have thought to build a building that looks like a stack of records? Once we were in Hollywood it was its normal Hollyweird self with tourists galore and loads of street performers. 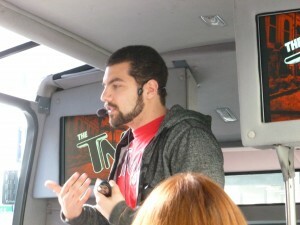 The tour itself was a lot of fun. We were loaded into a bus that only had nine rows and seated about 20 people. The bus included two video screens that played some well-known scenes of recent and semi-recent mishaps stars have had while in the Hollywood and Beverly Hills areas. This is not your typical Hollywood tour. Houses of the stars are not on the agenda. Instead we were shown various clubs, restaurants, hotels, and even street intersections where the famous hang out and/or got into some trouble. Our tour guide was a cutie named Alex who has a college degree and admitted that his mother wants to know when he is going to stop being a tour guide and get a real job. I wondered that myself, but have to admit if I was young and single, getting to be a TMZ tour guide and getting to appear on TMZ on occasion (as all of their tour guides get to do) would sound like a fun fun fun job! As we drove around Alex pointed out the famous hotels and restaurants to us. What struck the whole family is how normal and even mundane those famous places look in the light of day. But there, on the screen in front of us was someone like Paris Hilton, Kim Kardashian, or Britney Spears coming out or going into the place, lightbulbs flashing! Throw a crowd of paparazzi around a place, and have some famous person getting out of a car, and it really glams up a place! 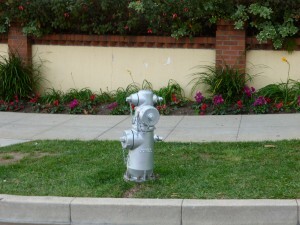 Fun fact: The fire hydrants in Beverly Hills aren’t boring old hard-to-miss-yellow, they are painted silver! The TMZ tour was about 2 hours and was a little on the pricey side at $50 a person. But it was for my birthday and a fun time was had by all. Oh, I also won a t-shirt by answering a trivia question. Whoo hoo! I can’t eat chocolate any more. Believe me, I feel sad on occasion about this, as I truly love the brown stuff. But when I eat chocolate now it makes me feel really, really bad, like three days to a week bad, so it has been relatively easy to stop eating it. Because I can’t eat chocolte I actually try other candy now, things I never would have tried before because, given the choice I ALWaYS picked chocolate. Just the other day I was in a candy store, one of those with bins and bins of different types of candy. I saw some Bit-O-Honey and thought that sounded good. I hadn’t had one in years. I bought two, just two, along with some other things, and walked out of the store. A little later, I decided to unwrap one of my Bit O Honey’s and popped it into my mouth. Oh my goodness! That little candy was amazing! It was so full of wonderful honey goodness! I really can’t fully express how good that piece of candy was! According to the Nestle website, it is a honey flavored taffy with almond bits in it. I really don’t care what it was, it was delicious! I recommend that you run, not walk, to what ever store near you sells that amazing candy and get some. Nestle, who makes Bit-O-Honey, did not pay me, bribe me, or give me money to say Bit O Honey is one of the most amazing candies on this earth, bar none. I just loved them. Now excuse me while I have another Bit O Honey. I found some at Michaels. of all places! Best to look FORWARD when driving! I am feeling like my karma is a little off recently. Yesterday was a fine example. I was rear ended by a driver who apparently spends quite a bit of time going forward while looking a different direction. I was trying to turn right on a red light (legal here) at a busy intersection. I started to go forward then had to stop as a car appeared from behind another car. The man behind me saw me start to go forward and NEVER LOOKED FORWARD AGAIN before flooring it several seconds later. Let me make this clear. Once I started to go forward, he looked left, waited until there was a small break in the traffic, hit the gas, and never during that time looked straight ahead again. What if there had been a pedestrian crossing the street instead of just me, hanging out in my big old car? In an effort to bring my karma into alignment I was very pleasant to the man who hit me. We exchanged information at my insistence and off we went again. I am happy to report that the Toyota Camry I was driving came through with just a couple of scratches on the bumper. I don’t seem to have whiplash. Sigh…. So, my lesson for the day: Look FORWARD when you are driving forward!